On the other hand, messaging apps such as WhatsApp, Facebook Messenger, and SnapChat rely upon IP to transport their messages. Without an IP connection, these messaging apps wouldn’t have worked. The plain Jane texting program that’s built into my Android 5 phone doesn’t need IP. SMS originally used GSM for message transport. Now it also uses LTE, CDMA, etc. T-Mobile provided SMS and voice calling service for days after the storm, before they restored my IP connectivity. They said that about 700 cell sites in Dade and Broward counties had been degraded by hurricane Irma. Caveat: SMS isn’t secure, as its transport mechanism, Signaling System 7, lacks an authentication protocol. Google SMS Search has broken again. My guess is that Google programmers are working on SMS Search. Google’s SMS Search service resumed working for a couple days, only to stop working again. The lack of an SLA (Service Level Agreement) from Google reminds us that building a mission-critical commercial operation on Google’s free services isn’t the way to go. I miss its quick weather updates. Whew! Google SMS Search resumes working. The recent outage of Google SMS Search reminded me that Google giveth and Google may taketh away. Google introduced their SMS Search service in 2008. I wrote an article about it (Receive answers from Google on your cell phone.) shortly afterward and have been using it since then on my dumbphone (a T-Mobile Samsung T-439 cell phone). It’s wonderful for checking weather, looking up addresses and phone numbers, etc. A couple weeks ago, it suddenly stopped working. Google SMS replied “Sorry, “______” does not return any results.” Yesterday morning, it resumed working, with no indication of why it broke. Many Google services are great when they work. Their free-of-cost nature, though, means that Google makes no commitment to service level. 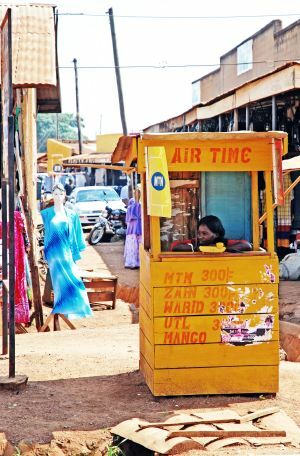 (also known as “mobile telephone booth”) in Uganda. In areas with cellular phone service but no Internet service, join people together with text messaging. Millions of people are still years and miles away from connecting to the Internet. Traditionally, Internet service to the public has been built upon either a foundation of PSTN (public switched telephone network) that’s been in place in the developed world for more than a century, or a newer cable TV infrastructure. How can people without these infrastructures exchange information quickly? In undeveloped areas, neither POTS (plain old telephone service) nor cable TV service is available. At one time, expensive private radio networks were the only way to communicate in real time. More recently, cellular phone service has become available as quickly as the cell towers can be built. Many undeveloped countries are skipping the stringing of telephone cables and are connecting via cellular phones. FrontlineSMS allows anyone with a cellphone and a computer (which does not need to be connected to the Internet) to create a community of cell phone users, in order to provide them with text data (“the market price for maize rose 2 cents yesterday“) and to collect data from the cell phone users (“we have 6 patients with malaria“). I’m impressed with what I see of FrontlineSMS Medic’s beta test version of PatientView software. It should help deliver medical care to people in undeveloped and disaster-stricken areas by receiving, collating, communicating one-to-one, and broadcasting medical data via SMS (“text messaging”). Like FrontlineSMS, it’s open source software. PatientView is part of Medic Mobile, an effort to improve health care in less developed areas. Link to video: An introduction to FrontlineSMS. I like what I see of FrontlineSMS: a simple solution that’s appropriate to its environment. Moves suggested by computer were telegraphed to player by cell phone text messages and body position of colleague. The French chess team has suspended three of its members for 5 years, following an investigation that revealed that they had cheated at a major chess tournament that was held in Siberia last September. The cheating scheme used one guy who, from his home in France, followed the moves via the Internet. He submitted each position to “a powerful chess program” (I have no idea which one), and he would send the move that was suggested by the chess program via SMS (text message) to a third guy who was at the tournament. The third guy would then place himself in the tournament room in accordance with an agreed upon code. The player learned the suggested move by watching the third guy’s movements in the room. The UK’s Daily Telegraph reports the story. The chess world is abuzz with questions, since the accused are merely suspected of cheating, yet have been suspended: http://www.chessvibes.com. Confession: Years ago, I read monthly magazine columns about computer chess. Unfortunately, although I like chess, I’m a poor chess player. Peter Jennings’ Microchess program, running on my wimpy little 1 MHz 8-bit, 8 kilobyte RAM Commodore PET 2001, c 1978, regularly defeated me. iPhone’s vulnerability to SMS attack revealed. Mr. Miller notified Apple of the vulnerability, and Apple is presumed to be working on a patch. Supposedly they’ve known of the vulnerability for weeks, yet they’ve made no official statement on this topic. Read more here: http://www.daniweb.com/blogs/entry4593.html# or http://www.computerweekly.com/Articles/2009/07/31/237129/iphone-vulnerable-to-hackers.htm or use Google for the latest news. Receive answers from Google on your cell phone. I use this to obtain weather, addresses, phone numbers, and driving directions. This is a variation of Homer Simpson’s surprised exclamation, "Oh, They Have the Internet on Computers Now!" Google is pushing information from the Internet unto cell phones — even simple cell phones. Google has entered the mobile market with a variety of products, including their free SMS (Short Message Service — "text messaging" to you and me) service. Most cell phones include text messaging at little or no extra cost; here’s a way to receive useful information on your plain Jane cellphone even if it can’t directly access the Internet. Google charges nothing for the service; your cell carrier may or may not charge you for each message. I use Google SMS to receive driving directions, estimated drive times, weather forecasts, business addresses and phone numbers. Sports fans can receive the latest scores. It can quote stock prices, and estimated flight arrival times. I find that it replies to my queries within 10 seconds or so. Distance: 16 mi (about 27 mins) 8 steps. Read about and try Google SMS demo. Gordon Welchman was an Englishman who, while working on decoding German messages at Bletchley Park during World War II, invented traffic analysis. His idea was that even if one couldn’t decipher message contents, just tabulating who messaged whom, when, and how frequently, lent knowledge about the enemy. After the war, he emigrated to America, where he became an American citizen and taught the first computer course at M.I.T. He worked for Remington Rand and eventually for the MITRE Corporation, where he enhanced traffic analysis technology and helped develop C3 (Command, Control, and Communication) systems. Following the publication of his book The Hut Six Story in 1982, which detailed the work of his Hut Six group at Bletchley Park, his security clearance was revoked. This killed his career in intelligence. Today we call the information that surrounds a message “metadata”. Well, both snowboarding and skiing. Reminds me of water skiing. The middle east coast states received buckets of snow this weekend and these New Yorkers made the best of it. Yes, that looks like Broadway in Times Square. Do you run a government agency but hate complying with the law? Then you need DC Matic, the Hillary Clinton-approved email server! What’s Hillary hiding? Classified emails? Sure. Evidence of her negligence in Benghazi that led to the murders of US citizens? Of course. Security breaches via assistant Huma Abedin’s Muslim Brotherhood connections? Probably. No, the ticking time bomb in this server is bribery. Maybe treason as well. She’s hiding written evidence of her deals that traded State Department help in exchange for large donations to the Clinton Foundation and large fees for speaking engagements by Bill Clinton. Both Swope and Obama were elected to office by fools who suffer from chronic white guilt. The changes I’m gonna make will be minimal. I’m not gonna rock the boat. Rockin’ the boat’s a drag. What you do is sink the boat.
. . . we are five days away from fundamentally transforming the United States of America. I’ve had tougher negotiations over a falafel sandwich! I first saw this sort of humor in a video clip taken from a biography of Hitler: United broke Hitler’s guitar, too!. I like this sort of humorous subtitling. And I like its message: Obama and Kerry are fools. The tune, “Slow Down”, is performed on piano and sung by its composer, Larry Williams. He was from New Orleans (of course). The tune, ringing with ninth chords, was released on disc in 1958. I think that the dancers are from a 1950s Hollywood rock & roll movie. Larry also composed Dizzy Miss Lizzy, Bad Boy, and Bony Moronie — classic rock tunes, all. He was born in 1935 and died on this date, January 7, in 1980. In the mid-1950s, Williams inherited star billing from Little Richard (who’d forsaken rock and roll for religion) at New Orleans’ record label Specialty Records. While Williams was alive, the Beatles paid their respects by admirably covering Larry’s Dizzy Miss Lizzy, Slow Down, and Bad Boy. I’m amazed that Larry Williams isn’t in the Rock and Roll Hall of Fame. Wanna see jitterbug? Wanna hear rock & roll? I’m delighted to discover that the video of Joni Mitchell’s classic Shadows and Light concert (1980) can be viewed in full (1h 13m) on YouTube. Supporting players are Jaco Pastorius on bass, Pat Metheny on guitar, Michael Brecker on sax, Don Alias on drums, Lyle Mays on keyboards, and The Persuasions. It’s among my favorite videos of a concert performance. Jaco was a Fort Lauderdale kid who began playing in rock bands around town in a variety of clubs: She, The 4 O’Clock CLub, The Village Zoo, The Flying Machine, The Button, Bachelors III, Ocean Mist . . . When I first heard Jaco in the early 1970s, he was playing bass for straight-ahead local rock bands. He graduated to more jazz- and fusion- related music and put his unique fretless Fender bass stamp on Weather Report. I’ve heard bass players tell me that they tried to imitate Jaco’s technique, but gave up trying; they claim that Jaco changed what it meant to play electric bass guitar. Jaco’s friend Pat Metheny, who plays a beautiful lead guitar in this concert, is a University of Miami music school graduate. Jaco seemed to still have his act together when he played this concert. Wikipedia has a good Jaco biography. He had a rapid rise to the top followed by a quick ride back down again. I had musician friends c 1984-87 who were torn up watching their friend Jaco dismantle his life. This Warner Brothers recording artist and Down Beat Hall of Fame member was sleeping on park benches and shooting baskets in a local public park. Michael Brecker and Don Alias died a few years ago. This is a classic performance by master musicians who were at the top of their games. Too bad it couldn’t last forever. According to Rolling Stone magazine, the FCC is considering disciplining NBC for airing an indecent performance on July 6, Miley Cyrus’ “Bangerz Tour”. I watched it. It was provocative, but artful. Bertolt Brecht would have loved the production: live dancers against rear-projection oversized animation with creative costumes and lighting. I loved it. Some of the images, such as Miley riding a giant “Mr. Wiener”, were sexually suggestive. The concert (recorded in Barcelona) reminded me of Madonna’s shows twenty-five years ago. Both performers have acceptable contralto voices, energetic dance skills, and assemble exciting Brechtian spectacles. I love the costuming and choreopgraphy. Shocking? “Bangerz” pushed the limits on prime-time American TV, I suppose. But that week on television, the atrocious performance by the Brazilian football team was truly shocking. You’ll need a fast Internet connection to smoothly stream this. You might be better to download the file and then play it locally with a good video player such as VLC. Is it Miley’s performance or just modern low distortion recording technique that for the first time makes John Lennon’s “Lucy in the Sky with Diamonds” lyrics (at 44m 35s) sound so . . . so . . . clear, logical, and complete? I’ve worked with integrated circuits (I.C.s) since the 1960s, but haven’t been involved in their manufacture — only their application. Today’s integrated circuit manufacture is a high stakes capital intensive business whose players use trade secrets to maintain their market advantage. I’ve never been inside an I.C. “fab” (factory), so it was a treat to find an hour-long presentation by an industry manufacturing engineer on YouTube. The technologies used at nano dimensions are mind-boggling. The presentation is aimed at the layperson and is filled with surprises. For instance, one gigabyte of semiconductor memory can be produced on a flat substrate within the diameter of a human hair. I give it two (gloved) thumbs up. 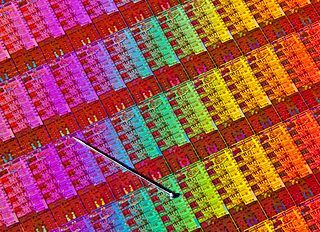 How are modern integrated circuits manufactured? Run computers. Don't let them run you. Please notice. Your phone's battery is overheated. How to turn off Android streaming. I hate wireless keyboards and mice. If you can’t explain it to a six year old, you don’t understand it yourself. In my experience, the best scientists and engineers explain complex concepts by using simple words in simple sentences. Dolts, on the other hand, make everything sound complicated. Albert Einstein liked simple language. Those who dare, risk failure. Those who don’t, ensure it. I just listened to an excellent interview with Walt Mossberg, who since 1991 wrote a weekly computer industry column for the Wall Street Journal. Walt’s now retired. Leo Laporte, an industry podcaster, coaxes some great stories from Mr. Mossberg. Walt’s perspective was always that of a user — not a tech freak. Most industry reporters are techies who don’t appreciate that most of us don’t care about the inner workings and secret mechanisms of computers. It’s a pleasant and informative hour-long conversation. In the 1970s and early 1980s, I loved ABBA’s music. I was pleased to discover this recent critique, in both spoken and written form. I didn’t realize that ABBA were considered politically incorrect in their home country. Intelligent Life magazine‘s Matthew Sweet observes that ABBA’s songs progressed from naiveté through sophistication to melancholy. As Matthew says, “Many of their songs are about accepting the failure of relationships”. Here’s the companion article, Thank You for the Music, by Matthew Sweet, from a recent issue of Intelligent Life. Both the article and the audio clip stem from his visit to Stockholm’s ABBA Museum. I enjoy listening to all Effortless Swimming podcasts. I listened to KERA’s Krys Boyd interview author Steven Pinker about one of my favorite topics: plain English. Mr. Pinker authored The Sense of Style: The Thinking Person’s Guide to Writing in the 21st Century. He claims that education often interferes with a person’s clarity. He refers to this wordy English dialect as academese, which is similar to corporate hack boilerplate. I agree. Most academic papers are terribly written, as is the text in many corporate websites. Both dialects employ the passive voice and zombie nouns: nouns created from verbs. For example, instead of appearing, there is an appearance. Instead of cancelling, there is a cancellation. Now that not just one, but two movies (Breaking The Code and The Imitation Game) have been produced about Alan Turing, it’s time we had a movie about Ada Lovelace. She seems to have possessed an unusual combination of precise reasoning and imagination, strong will, and feminine charm. Plus, she was in the middle of a tug o war between her feuding parents, poet Lord Byron and his wife Anne Isabella. Why is Ada important? She’s acknowledged to be the first computer programmer (c 1840!). Like Mozart and Turing, her life was tragically cut short at a young age. I propose this biopic today because it’s Ada Lovelace Day! BBC Great Lives 28-minute audio portrait of Ada Lovelace. Why not a movie about Ada? While verifying quotation authenticity, I found a useful — and delightful — website, quoteinvestigator.com, which tries to chase down the origins of quotations. If you’re using Windows 7 or 8.1, and you’re sick of being nagged by Microsoft’s pop-up to upgrade to Windows 10, go to the Ultimate Outsider website and download and install their GWX Control Panel. It’s received rave reviews. Cost: gratis. Here’s the full description. Update, April 3, 2016: Steve Gibson, founder of GRC (Gibson Research Corp), has written a great little freeware utility that also blocks upgrades to Windows 10. Steve writes most of his code in assembler, so his utilities are tiny. He calls this newest utility Never10. He’s created a page dedicated to Never10, where you may download it for free. It’s only 81 kilobyes in size and doesn’t require installation on your Windows PC. You need just run it once to turn off upgrades to Windows 10, and run it again to allow upgrades to Windows 10. Short and sweet, it’s just what the doctor ordered. Save time when installing application programs on a PC. Installing two or more application programs on a PC can chew up your time as you wade through web pages, download prompts that don’t always work, and questions and answers. Now ninite.com (http://ninite.com/) does this tedious work for you. I’ve tried it on a few PCs and it’s worked flawlessly. Install everything in one easy step on your brand-new Windows 7 PC! Thanks to The Real Deal podcast for this tip.